One day an old woman had just prepared her favourite pumpkin soup and was going to eat it when somebody behind her back sneezed aloud. «God bless you!» said the old woman and looked back over her shoulder to see who was there. She could hardly believe her eyes. There stood a devil. His face was red and he had two white horns on the top of his head. It is generally known that devils are unpleasant, but this devil was very nice and funny. That’s why the old woman was not scared of him at all. 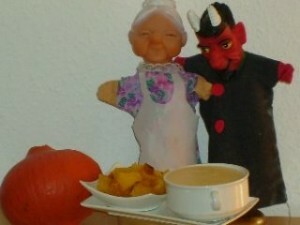 „Pumpkin soup? I have never eaten this kind of soup before!“ exclaimed the devil and took a deep breath. “Sit down and help yourself with baked pumpkins and I will pour you a bowl of pumpkin soup”, said the old woman to the devil. Fry the bacon with the onion in a saucepan. Add diced pumpkins, some water, bring to boil and simmer until the pumpkins are tender. Place the pumpkins, butter, cream in a jar of a blender and blend until combined. Add extra boiling water if the soup seems too thick. Return the soup in the saucepan and bring to boil. Add lemon juice and season to taste with salt, pepper, nutmeg and coriander.